4 stars for this excellent Sci-Fi based anime. 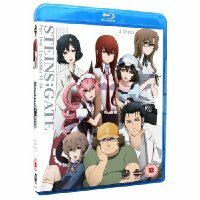 This is part 2 of the TV series Steins; Gate and picks the story back up at episode 13 "Metaphysics Necrosis", just one of many mind-boggling titles to follow. Our hero Okabe (J. Michael Tatum - Hetalia Axis Powers), a self proclaimed mad scientist and his friends and colleagues Daru and Kurisu (Trina Nishimura - Deadman Wonderland) have finally succeeded in creating a device that is capable of sending messages into the past (D-mails),but in doing so, make some significant changes to the past and attract some very unwelcome attention in the form of SERN, an evil corporation who Okabe suspects of trying to manipulate time to their own ends.